The Full Moon in Scorpio makes tonight not only the perfect time for reevaluating any new beginnings you made during the New Moon last month, it also marks the moment that the moon will be closest to Earth all year. 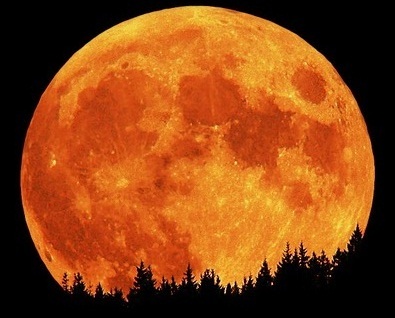 Scientists have dubbed it a "Super Moon", and it will be at its fullest at 11:35 p.m. EDT. According to Mashable, the best time to watch for it will be "during moonrise or moonset. At these times, due to reasons astronomers don’t fully understand, the moon can appear much larger than when it is higher in the sky." And- if that isn't exciting enough- a meteor shower from Halley’s comet will be peaking tonight, as well. That's why, as soon as I hit "Publish" on this here post, my little family of three will be taking a hike up to the top of Griffith Park to catch the best view. I also wanted to mark this time of super charged energy by gifting you all with a kickass play list. I LOVE Rock & Roll, and I especially dig WOMEN who rock. There's just something so empowering about a good beat, a wicked guitar riff & a girl shouting about... whatever the f#ck she wants to! THANKS, Sonja. Keep up the fantastic work!